With just over a week to go until Liverpool Ladies play their first home game of the new season against Reading FC Women on Friday September 29, fans can still buy their season ticket. Watch the likes of England internationals Siobhan Chamberlain, Alex Greenwood and Casey Stoney in action against some of the best teams in women’s football at the Select Security Stadium in Widnes. The season ticket offers great value for money with entry included for all Reds home games across three major competitions – The FA Women’s Super League, the SSE Women’s FA Cup and the Continental Tyres Cup. Disabled supporters with wheelchair access requirements are asked to purchase season tickets for LLFC by contacting 0151 263 2361 or emailing LadiesEnquires@liverpoolfc.com to discuss individual requirements. 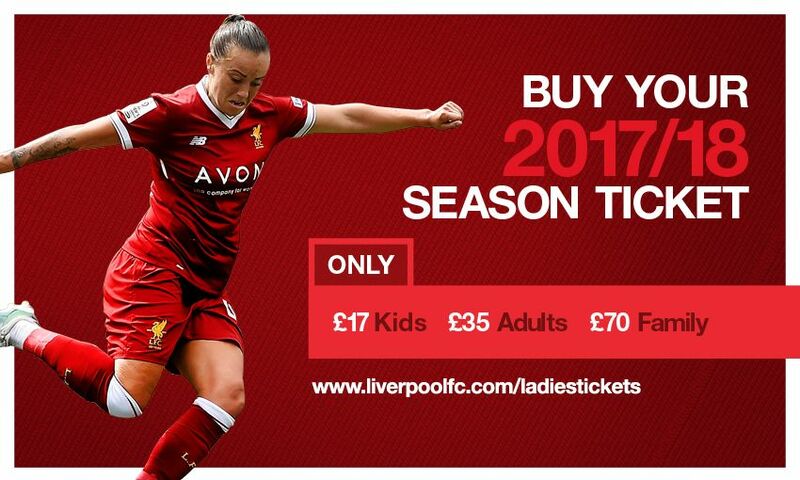 Supporters can purchase season tickets online, which will be sent along with a welcome letter from Liverpool Ladies captain Gemma Bonner. Individual match tickets can also be purchased. Adults are £5 online or £6 on the gate and children (under 16) and concessions are £2.50 online or £3 on the gate. For any more information about season tickets for Liverpool Ladies FC, please email LadiesEnquires@liverpoolfc.com. Supporters should note that although Liverpool Ladies play their first Women's Super League game of the season on Friday against Everton at the Select Security Stadium in Widnes, this is classed as an away fixture. Both teams share the ground for home games.